Limassol, the second largest city is located in the southern part of Cyprus between the ancient kingdoms of Curium and Amathus. It is one of the major tourist resort in Cyprus, has the biggest port in the island and it is the home of many offshore companies. Host of the two biggest festivals on the island, Carnival in early spring and The Wine Festival in late summer. Both festivals attract locals, as well as tourists from all over the world. 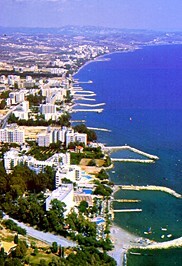 Limassol is also the wine-producing center of the island. The surrounding country side is filled with acres rich with vineyards. There are many sites to visit in Limassol such as the Limassol Castle, Old Port, Limassol Museum, Tourist Area and the Beaches, however the more glorious sites are outside of the city in the nearby countryside. These sites, as well as all over Cyprus are rich in history and legend. Kolossi Castle, an impressive 15th century castle with 3m thick walls was built by the Knights of St. John of Jerusalem to be their headquarters. Next to the castle is the sugar refinery building. Is about 10km from Limassol. Curium, the major archaeological site in Cyprus was one of the old kingdoms of Cyprus. Remains of its various settlements include a Greek temple, houses with superb mosaics, theater which is stands high up on the cliffs overlooking the blue Mediterranean sea, one of the most breathtaking sites in Cyprus and a stadium of the Roman era. The Sanctuary of Apollo Hylates (God of the Woodland), Apollon was worshipped here from the 8th century BC. It’s 3km west of Curium.The buildings were destroyed by earthquake many years ago but you can still see the small temple and the beautiful columns.